You are here » TheOldSchool » Group Application » ADoKaN's OldSchool application. 2)How old are you - ? Be honest I am 15 years old. 5)Why do you want to be in this group - ? I want to join the OldSchool clan because it means alot since I have get a deep knowleadge about it, in addition, I want to join this clan because it is ordered between the best clans on the server where we play on, So I want to join this clan to have fun with its members and to get new friends, uhh why not? If I get accepted it will be much appreciated. 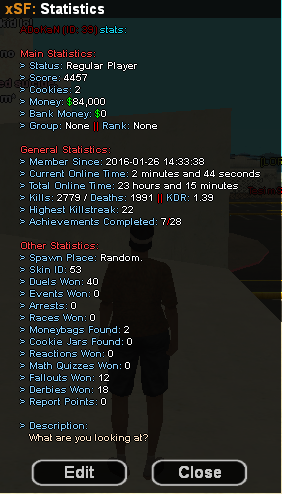 7)Screenshoot of your in-game stats - ?